We are a couple, A Thai and a Dane. Naluang Panyadee and Freddi Jacobsen. We have been planting churches in Thailand together for now five years. We are independent because there are not yet believers in this place that teaches the Hebrew roots, and are implementing the Jewish-ness of our Lord. We are learning to let go of our Greek thinking and embracing the thinking of the first believers, as we see in the Acts of the Apostles. Our Logo is a combination of Davids Star and the Cross, since our roots are from "David" and therefore the "Son of David", and the Sacrifice Yeshua did for us, when He gave His life. The cross is the covenant sign given to us, and that is why Islam want to remove it from public view so only their faith will be shown. 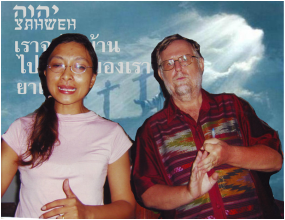 My wife is Thai and comes out of a big denomination in Thailand, we are not attending any church group as it is, so we are independent as for now. I attended the biggest church in Copenhagen, who also sent me out on a mission project, which has evolved beyond that commissioning. All that I am doing now, started about six years ago, when a friend of mine asked for money, and my response was "Sorry, not enough at the moment", as a personal believer she answered, is your God not able to help you, where is your God. That started my quest, or searched for more. Three months later, just after new year, I began to cry out, I wanted more, It was no longer enough for me to witness, to work, I wanted more. One of the first days in January, I took my motorbike and gave an ultimatum to God, If He did not provide a church that would allow me to do my work, that day, I would leave Thailand and return to Denmark. I had heard that there were several churches in the area, but could not find them. So I began, but could not find anywhere, then on the way back I could remember a rusty sign on the main road, found it and went u the road, then suddenly I saw it, right there, in the middle of nowhere, up on the road I stood, a young man came running out, and began to talk, inviting me down, the pastor a Thai, spoke good English, and within the month I was invited to give a sermon. That lead to another and then another, at the end of each sermon, the pastor wanted me to pray for the members, God gave wisdom words about the individual, and people began to fall in the Spirit, Our Fathers presence was too intense to stand. Suddenly we had a real revival growing, It was like heaven was very real in our meetings, and the prayer meetings changed too, more people began to come, and all got heavily touched by Our Father. Personally I began to have manifestations of His presence and the working of the Holy Spirit. Like I didn't sleep more than an hour or two for the whole of three weeks. Every night was thick with His presence. I have never really prayed for the sick before, now every time I prayed for their sicknesses they all got healed. After a couple of months, they wanted to continue the whole thing without my presence. Result was God withdrew. Within a few months, I was invited to teach in a local church group fare away from our town, one day we were driving my motorbike from that place to my town, a long trip, two third of the way I had a flat tire, needed a mechanic, the one we found, while he was working, my wife to be at that time was asking the man he seemed to have problems, and suddenly she put me on the spot, "Freddi you have to pray for this man, s centipede, a poisonous one, had bit him and his hand was swollen with a lot of pain." So, I did pray, this was still so new for me, I took his hand between my two hands, while praying I could feel his swollen hand go down, to normal size. He still had a lot of pain, so I prayed again this time for the pain to go away. After praying, we asked what was the different, he was laughing, all gone. Completely healed. As we got married in August that year, we started our own church within a month, on invitation. By our local pastor associate, After new year we started our own church inside the city in center of town, as I had told the first pastor I was associated with, after he told me to stop, he died a sudden death. So his mentor came and asked me to join him, which I did, and he told us, my wife and I to go and help them, so when we started on Gem Street, we started on our own, and had a small group from the beginning, ten people. Things were happening. Healings, financial miracles. and so on. So when spiritual warfare started, the Thai were very ill prepared. During our time there we organized our own conference, with root teachings, healing and dream interpretations. The other churches who came willingly saw what God could do, when someone would stand up. They got hope too. Based upon our experiences, God answering with sign wonders and miracles, even being a tool for revival to break out. We know who we are in Christ, we know by ourselves we cannot do anything, we know what He is confirming again and again. We are able to come also to your town or city, even to your country when needed. Please go to the Contact Us page to find how you can get in contact with us. The mission of New Beginnings Thailand is to help us in getting closer to God, and Him closer to us, to be a bridge of unity and restoration between Israel and the Church, releasing God’s fullness throughout the earth. That we shall become one just like He is one. Everybody needs a new beginning, in our lives, our relationships, to bring words of healing, physical as well as inner healing, Restoration for the whole man, Restoration for the whole house of God. Revival starts here, before it gets to the nations, it is being activated through a deeper understanding and revelation of the power of covenant. The Purpose of the New Beginning is to facilitate covenant restoration through the reconciliation of Jews and Gentiles coming together as the One New Man. One person, one couple, one family, one town at a time. We went to a seminar combined of Glory of Zion Ministries, Glory Ministry Thailand, and the The United Church of Commandment, We knew as we continue to work with an increasing group of Churches and House fellowship around, as we are being invited to do, that asks us to be a spiritual covering for them, that we ourlesves need to be in a spiritual allignment with a Thai Chritian fellowship, and not just an International, so we got in contact with UCC Thailand, and they agreed to start the contact to get fully alligned with the as we also are indirectly alligned with Glory of Zion. The link to UCC fellowship is here bellow. You might have to copy it into your web browser. At the end of May and Beginning of June, we began to transfer the ministry to Sakao, so we will be closer to all our small groups from Sakao to Chantaburi, it is not yet finished, we still have to move a lot of things, that can help us to fulfill our mission. We are in contact with all (most) churches in this province, and especially the church "next door", Ajarn Gart, AJ Gart of Hope Church. This first month, and the next will have alot of focus on establishing an income to do our ministry. we have started two franchise businesses, at it costs a lot to get started, but we already sees God's blessings. It has been decided to transfer to Aranyaprathet, due to some of our former associates needed pastoral care and oversight. So now we have been able to get a very good place in Aran (short for Aranyaprathet). A four story building, with a lot of space to develop our ministry. When we began in Surin, we wanted to be able to be a ministry that could help Christians to get inner healing and help to overcome strongholds, that need special attentions and help, especially Christian leaders, so we are looking forward to be able to establish that kind of a ministry here in this part of the world. Even international Christians are welcome to come and visit our hospit. We do receive some support for our ministry, so God is confirming for us that this is His way for us, we are also trying to get our two franchises going, but we need about two hundred customers to do that.